Last month, at Google’s 20th anniversary event, the company's head of search quickly shut down my question about the firm's ambitions in China. We'd heard, thanks to a slew of credible leaks, that the firm was developing a search engine for the country, one that would toe Beijing's line on censorship. "Right now all we've done is some exploration, but since we don't have any plans to launch something there's nothing much I can say about it," Ben Gomes said. 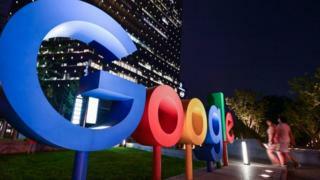 He was repeating the company line on the project, codenamed Dragonfly, which was made public thanks only to various leaks, some high profile resignations and a petition signed by hundreds of Google employees protesting against the idea. Now, a freshly leaked transcript of Mr Gomes addressing employees suggests he perhaps wasn't being entirely forthcoming in our interview. Published by The Intercept on Tuesday, his words suggest an enthusiasm and readiness that arguably goes well beyond "exploration". "Overall I just want to thank you guys for all the work you have put in," reads the transcript, said to be taken from a meeting on 18 July at which Mr Gomes addressed those working on Dragonfly. "We have to be focused on what we want to enable," he goes on to say. "And then when the opening happens we are ready for it." He suggests a product or service of some kind is on the way, though acknowledges the unpredictability of trying to (re-)enter the Chinese market, particularly at a time when the country is sparring with the US on trade. "While we are saying it's going to be six and nine months [to launch], the world is a very dynamic place," Mr Gomes said. Google refused to confirm or deny the authenticity of the transcript when asked by the BBC. A spokeswoman did, however, offer a statement on whether or not Mr Gomes had been dishonest. "No, the comments in his interview with you are consistent with the state of where the project is at," she said. "As we've said before, our efforts are exploratory and we are not close to launching yet. Any suggestion that Ben was not being accurate is simply wrong." Now if I'm to give Google the benefit of the doubt for a moment, it's fair to say the transcript does reveal a sense of unpredictability, a sign that nothing, as yet, has been set in stone. "It's not been easy working on a project with no obvious outcome," Mr Gomes is quoted as saying. And, in what may be a nod towards the anger directed towards Dragonfly, Mr Gomes seemed to address some discontent in his ranks over the project, at one point telling employees: "We are working with you to make sure your careers are not affected by this." But the rest of what Mr Gomes said suggests Google's China strategy is less about exploration, more about powering ahead. After all, as Mr Gomes acknowledges, the potential to make money in the region is enormous. "Of the people who are internet-enabled, a huge fraction of the ones we are missing out are in China […] It's clearly the biggest opportunity to serve more people that we have. And if you take our mission seriously, that's where our key focus should be." Standing in Google's way is the uncomfortable reality that many people do not agree with that focus - including the vice-president of the United States, Mike Pence. He has said Google should "immediately end development" on Dragonfly. I can't fathom how Google thinks this will end. Recent history shows how executives at the company have chosen to hide from immediate public scrutiny, only to seriously regret it later. With Dragonfly, the company simply refuses to share details - not even with US lawmakers. In September, Google’s chief executive Sundar Pichai did not show up to a Senate Intelligence Committee hearing. A week later, Google sent along its head of privacy, Keith Enright, to a different committee's hearing. When asked about China, he said he was "not clear on the contours of what is in scope or out of scope for that project". Mr Gomes certainly knows the scope. In the meeting, he called it "important and worthwhile", adding: "I wish ourselves the best of luck in actually reaching our destination as soon as possible." What I want to know is: when will Google tell us where it is going?